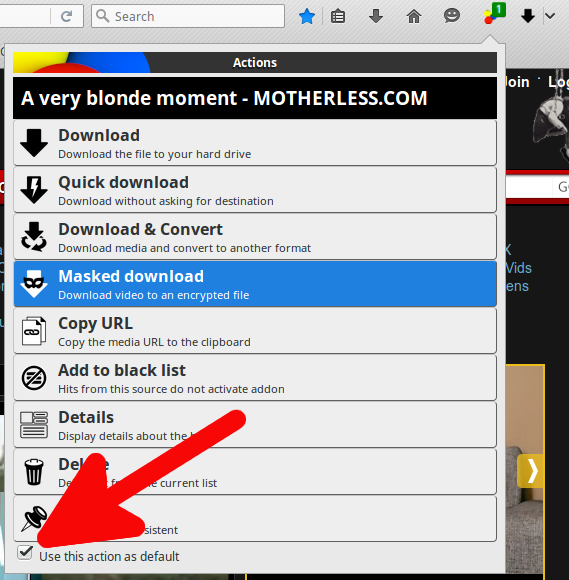 The Masked Download action is available on the Firefox version of Video DownloadHelper, version 5.6.0 and above. It ensures that files downloaded that way cannot be read from your disk without the appropriate tools and credentials. In a normal download, once you perform a download, you end up with a file, like my-video-file.mp4. When using the masked download action, you get 2 files, for instance 36c231f8020d454a88aa1e6ccac1d1bc.bin and 36c231f8020d454a88aa1e6ccac1d1bc.vdh. The .bin is the original data file (with the exact same size) encrypted using the AES-256 algorithm. The .vdh file contains metadata about the file, like its name. Note that without the .vdh manifest file, there is no way to decrypt the .bin data file, even if you know the encryption password. How to perform a masked download ? Then, in the Actions Panel, pick the Masked Download entry. How to perform masked download by default ? How to change the encryption password ? The Masked Download feature comes with a default password that ensures the file can be recovered by the viewer tools. This might be enough for your privacy needs. 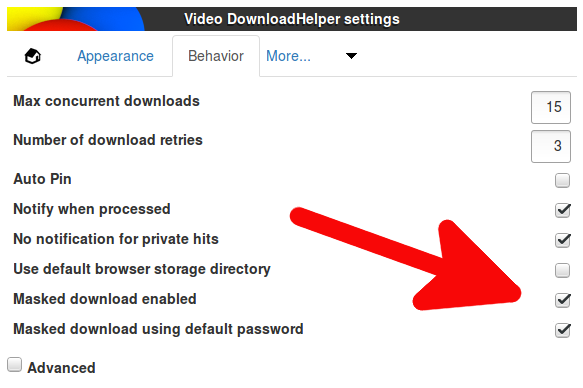 If not, you can change the encryption password from the Video DownloadHelper settings, tab Behavior. Uncheck Masked download default password, then you will have a link to set a new password. Important notice: the new password is saved in the Firefox internal password database. If you ever lose your password and your Firefox user profile, you won't be able to access your files any more. How to access the encrypted files ? Alternately, on Windows 7 and above, you may want to use Masked Video Player which can play the encrypted videos directly.